Odiya folks love their flavorful Kosala/Leutiya/Khada/Sajanna Sagaa. And with a whole range of greens being available in the local markets around the year, it is hardly a surprise that the humble 'Palak' or palanga sagaa as we call it does not get the respect it deserves. However, with the latter being elevated to the status of a superfood, Odiya folks are trying hard to incorporate it in their menu. No easy task adjusting to the slight astringency of the Spinach. Unlike the mellow sagaa's that we consume, this one has a overbearing effect on the palate. No wonder most North Indian recipes include generous amounts to ghee to tone down its strong taste. But copious amounts of ghee is a strict no-no in oriya food except for the osa-baras or the fasting days. Hence was born the 'Palanga Dalma', a variant of our 'Buta Dalma'. A nice combination of spinach, vegetables and lentils, this makes for a very nutritious sidedish without the added calories. Ingredients - 3 cups chopped palanga/spinach, 1 1/2 cup split channa dal, 1 cup cubed pumpkin, 1/2 cup cubed potatoes, 3-4 dry red chillis, 1 tsp oil, 1 tsp ghee, 1 tsp cumin seeds, 1/3 tsp jeera-lanka gunda (roasted cumin chilli powder), 1/5 tsp cinnamon powder/garam masala, 1/3 tsp turmeric, salt to taste. Preparation - Wash and soak the channa dal for 2 hours. Cooking - Take the channa dal, pumpkin cubes, potato cubes along with salt and turmeric in a pressure cooker. Cook for 1 whistle on high flame. Heat the oil in a wok. Add the chopped palanga and stir fry till soft. Transfer to the pressure cooker and mix with the cooked dal. Heat ghee in the wok. Add broken red chilli and cumin seeds. Pour the spluttering mix over the contents of the pressure cooker. Put the pressure cooker back on medium flame. Add the jeera-lanka gunda and cinnamon powder. Simmer for 2 mins. 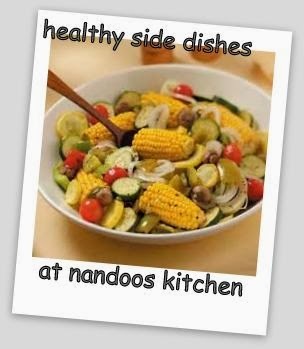 Sending this to the event Healthy Vegetarian Side Dishes hosted by Nandoo's Kitchen and Priya's Versatile Recipes . Very Comfort Dal. Looks good. Thanks for linking this to my event. Very healthy dish.